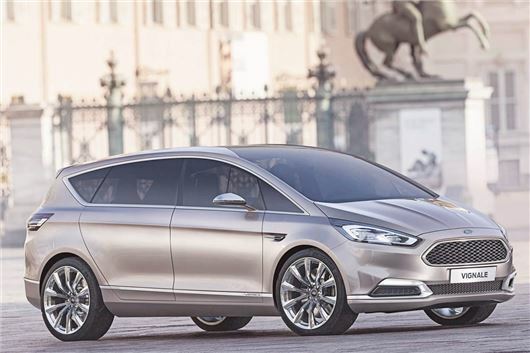 Ford has revealed the Vignale version of its S-MAX concept car in Milan. The higher quality, more luxury oriented model will go into production and will sit at the top of the S-MAX range. The S-MAX Vignale is expected to arrive in showrooms in early 2015, following the introduction of the all-new S-MAX late in 2014. The S-MAX Vignale features high-grade quilted leather upholstery, unique Vignale seats, leather dashboard trim, a panoramic glass roof and large, 21-inch chrome finished alloy wheels. Launched in Milan, the S-MAX Vignale features touches inspired by Milanese fashion including its Milano Grigio exterior paint finish. While it might be called a concept, the S-MAX Vignale looks close to production ready, although the production car will have less extravagant seats and more kerb-friendly alloy wheels. It will, however, feature the same high-grade leather and metal detailing. The S-MAX Vignale, along with all future Vignale variants of Ford models including the new Mondeo, will only be sold at selected dealerships. Rebranded as ‘Ford Stores,’ these will have bespoke Vignale lounges and staff dedicated to providing higher-quality service. Ford Stores are also the likely home for the upcoming Mustang. Vignale customers will benefit from a much higher level of service, with the option to have their car delivered to them at the airport after a business trip or holiday, or to have it collected for a service from work - with a replacement Vignale courtesy car provided at the same time. Ford is launching Vignale in Europe from early 2015, initially with the S-MAX, followed shortly after by the Mondeo. The Vignale trim level is also expected to appear on the Kuga and the upcoming Edge large SUV. But its still a ford, no level of service will make it a BMW Merc or Rolls-Royce, so why spend the extra ?? ?